It happens every year. It shouldn’t come as a surprise, but how many of us actually plan for it? Yes, I’m talking about the time change that will happen for most Americans at 2 a.m. on November 2. But relax—really—it’s the good time change. The one that gives us an extra hour to play with and for three lucky winners, a chance to win our Sleep Improvement Kit. 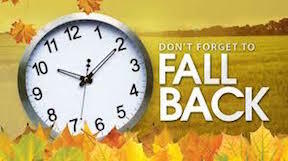 For many the “fall back” transition marks the end of daylight savings which is often viewed as a great opportunity to catch up on some sleep. But, do we really? Even if we try to take advantage of that extra hour, it doesn’t necessarily equate to an efficient night of sleep. Or even a longer night. Ask any early riser. Better yet—any parent. You can tell your child or even yourself that you don’t have to get up until 7 a.m. standard time. But if the body is used to getting up at 7 a.m. daylight saving time, it’s very likely that they will be getting up at 6 a.m. standard time. But avoiding sudden changes in the schedule of young children is a simple matter of planning. Make the switch a gradual one. Start a few days before, setting your child to bed ten minutes later each night. By the time Sunday rolls around, he or she will be more acclimated. To sync your own internal clock, avoid bright light at night even when going to the bathroom. Try using a preinstalled dim night light and blinds to block bright light in the morning. Light is the main cue that helps keep our clocks on track. Expose yourself to as much natural light as possible. And as always, follow all the rules of good sleep hygiene. Avoid sleeping pills, caffeine and alcohol before bed. The contest will run through Saturday, November 1. All participants must live in the United States to win. One winner will be randomly selected and notified on Monday, November 3. All shipping addresses and email addresses will only be used to deliver the sleep improvement kit. To stay tuned on all things daylight savings follow @SleepRate on Twitter and good luck!